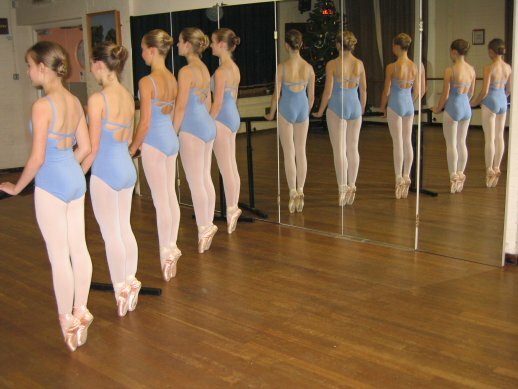 The ballet classes are based on the Cecchetti method and include unset as well as syllabus work. We encourage an appreciation of all aspects of ballet, including mime, character, repertoire and music. We have staged a number of highly acclaimed ballet performances. We arrange visits to the Theatre, usually in Reading, Basingstoke or London and encourage those interested in choreography. The school's policy is to try to keep young children together with their contemporaries. Following a comprehensive approval process the School was awarded Dance Centre Status by the Imperial Society of Teachers of Dancing. Our classes are therefore run within the National Currriculum. We can offer our students the opportunity to take a FDI or CDE in Dance. Petites This is the class for our youngest children. Normally aged from 4 years as we find that below this age they are not ready to begin ballet training. This is a 30 minute class once a week. Primary Children in the Primary Class are studying for their first ballet exam. The primary exam is a class exam. That is to say the children are entered in groups and are examined with their teacher doing the excercises together. In order to cover the extra work this is a 45 minute class once a week. Standards Children in the standard classes are studying for the class exams. These exams are designed for children doing one lesson per week. Since groups of children progress together up the school we may not always have groups at every level. So, for instance, we might run a standard 1 and a standard 2 class in one year and a standard 2 and standard 4 class the next. Grades Children entering grade examinations do so in small groups without an accompanying teacher. As they progress up the grades the groups become progressively smaller. Therefore it is necessary for them to have a much better knowledge of the syllabus than for standards. As a result we insist on children entering grade examinations doing two classes a week. Major Vocational Exams Beyond Grades dance students are preparing for a career in dance. Intermediate Foundation, Intermediate, Advanced 1, Advanced 2 are examinations that explore in increasing depth a candidates understanding of dance technique. As our school is limited in size, places may not always be immediately available. It is helpful for us to see a prospective student some time prior to entry, so that we can assess his or her correct level. We attach great importance to regular attendance. For children from the age of eight, who show promise and enthusiasm, we offer extra classes. We have a number of adults (and teenagers) who attend our classes with no intention of pursuing a career in dance but simply for the pleasure, grace and strength which regular ballet classes provide.